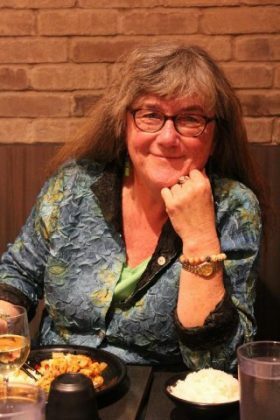 Kathleen McClung, (San Francisco, CA) Associate Director of SMK Literary Competition, is the author of two poetry collections, The Typists Play Monopoly (2018) and Almost the Rowboat (2013). Her work appears widely in journals and anthologies including Southwest Review, Naugatuck River Review, Unsplendid, The MacGuffin, Ekphrasis, Atlanta Review, cahoodaloodaling, California Quarterly, Forgotten Women, Sanctuary, Fire and Rain: Ecopoetry of California, and elsewhere. Winner of the Rita Dove, Morton Marr, Shirley McClure, and Maria W. Faust national poetry prizes, she is a Pushcart and Best of the Net nominee. Kathleen holds masters degrees in Education and English from Stanford University and CSU Fresno. She teaches at Skyline College and The Writing Salon in San Francisco, and has taught/advised student teachers in the credential program at Mills College. For ten years she has directed Women on Writing: WOW! Voices Now on the Skyline campus, celebrating creativity in writers of all ages. In 2018-2019 she is a writer-in-residence at Friends of the San Francisco Public Library.